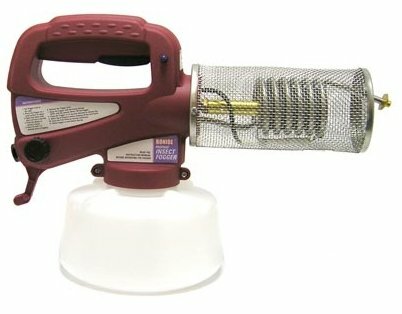 Manufacturer – Bonide Products Inc.
Bonide 420 Fog-Rx propane fogger is one of the best selling propane fogging devices on the market. It proves to have good built quality, decent price and it operates well. This is a thermal fogger, which uses propane gas for heating the coil. It is recommended to use Bonide 420 fogger outdoors as it works with an open flame which can cause fire safety risks if used indoors. Igniter – igniter button allows to ignite a spark to light the coil of the fogger. The coil can also be lighted with a match or a lighter, but igniter button makes it more convenient so you do not have to carry matches or lighter while you fog. Fogging trigger – This trigger is used in fogging process. When trigger gets pressed the fog is released. Gas release valve – As with all propane foggers, gas release valve controls the gas flow form a propane cylinder to coil of the fogger. Bonide 430 Fog-Rx has got a translucent container that can be filled with an insecticide or other liquid used for fogging. Thanks to the translucent plastic material you can see how much insecticide is left in the tank and plan accordingly, when you will need to refill the insecticide. The Bonide fogger uses a regular propane cylinder, which is NOT included with the unit and must be bought separately. Bonide advise to use a 14.1 oz propane cylinder which is the thinner and taller type of cylinder (10.5 inches tall), and they do not recommend to use the short cylinder. 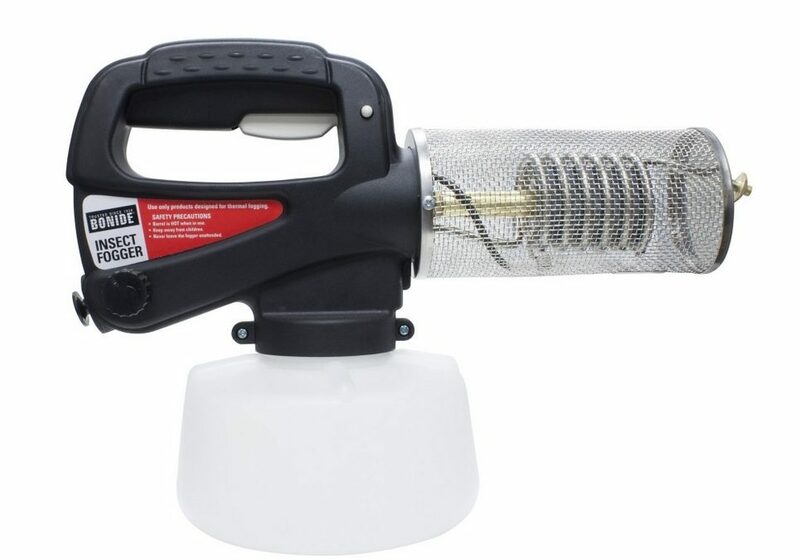 However, we found that the fogger works with both types of cylinders, but you might get more “fireballs” spit from the fogger when using the short propane cylinder and fogging with a full or close to full cylinder. So if you have a chance, it’s better to buy the thin and tall cylinder rather than the short one. The cylinder can be bought at most hardware stores for about 10 or less dollars. Before starting to fog light up the fogger and leave it for few minutes so it heats up. This way the fog cloud produced by the fogger is going to be larger and more dense. 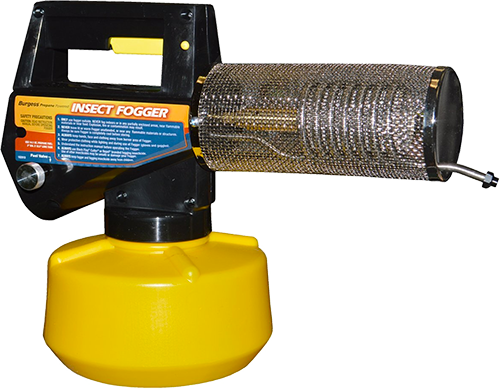 Overall this fogger produces really dense fog cloud which will reach every smallest area in your garden and around your house to terminate any unwanted insects. 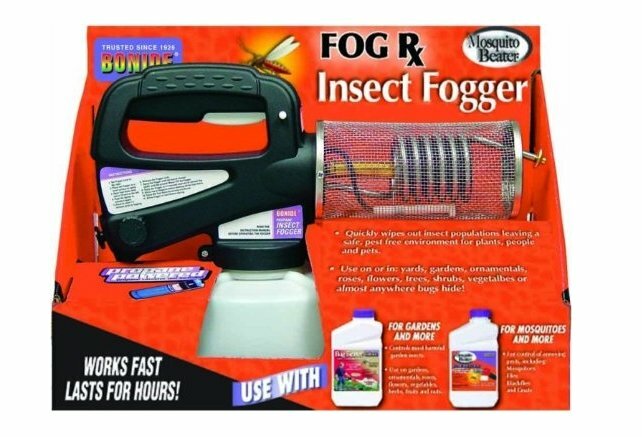 Manufacturer suggests that you use this fogger with a Bonide Mosquito Beater insecticide, but it can actually be used with any other insecticide that is made for mosquito foggers, for example, with the Black Flag 190255 insecticide. As this is a portable fogger it is pretty light, which makes it more easy to carry around. The weight of the unit is 4 pounds (1.8 kg) without the propane cylinder. 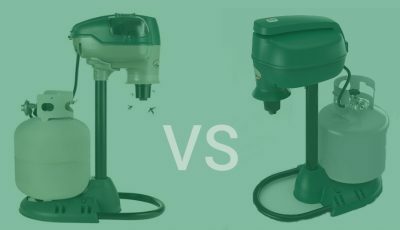 It has about the same size when compared to other similarity priced propane foggers. 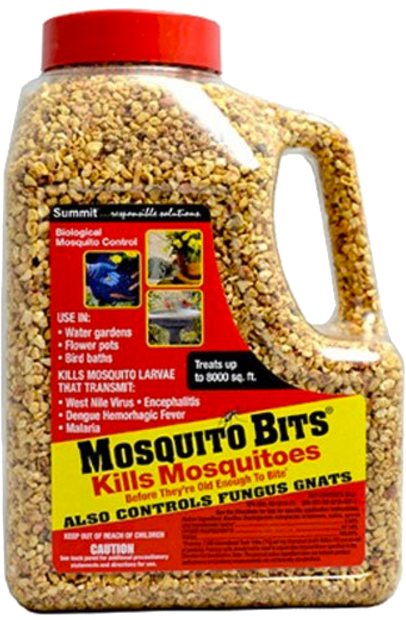 The dimensions of the Bonide 420 mosquito fogger are: 8.2 x 13 x 5.5 inches (20.8 x 33 x 14 cm). 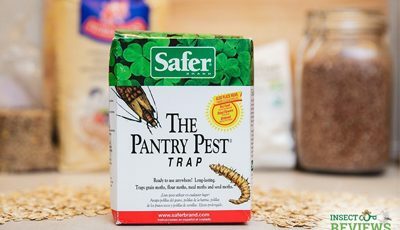 InsectCop Reviews: Is Pantry Pest Trap by Safer Brand Effective Against Moths? If mixing an insecticide for use in this Bonide 420 Fog-RX, can it use both water base and oil base products? You can use it with both – water and oil based solutions, however, for the best results we recommend using it with the oil based solutions. As for mixing water and oil solutions, we don’t recommend that. 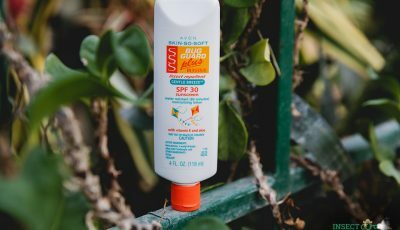 If the fogging solution you have purchased requires mixing it with other substances (such as water), those allowed substances will be indicated on the label of the product. Hi I will be using this on a film set as a portable fogger and was wondering should I use Propylene Glycol (water based) as the solution as it is non-harming to people and also the environment?